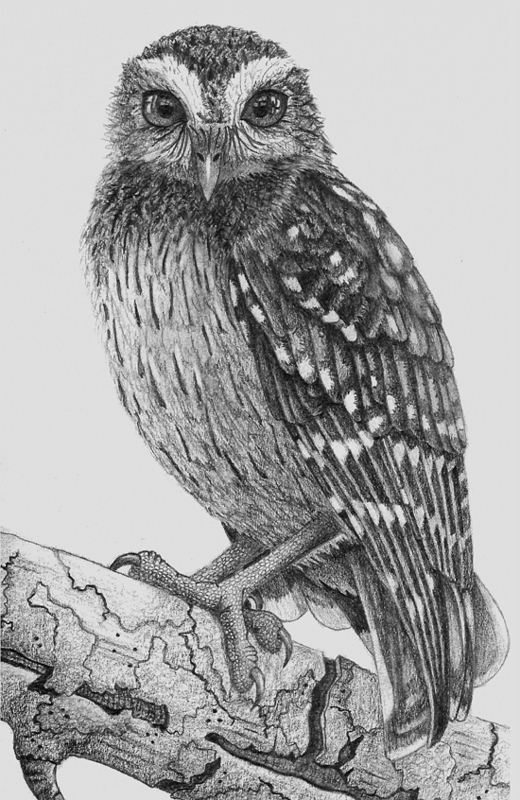 The Bare-legged Owl is endemic to Cuba. I found this big-eyed, feathered creature in the June 2015 issue of BirdWatching. I wanted to draw a bird from a BIG photograph and I noticed my local library has a small stack of BirdWatching magazines. Perfect! This is the most detailed bird drawing I’ve created so far. It took me a few hours over a few days. I enjoyed focusing on one feather group at a time – drawing out its overall shape, then examining the feathers and drawing their basic shapes and finally adding the lights and darks of each feather. The eyes and legs were also interesting to examine and bring to life in graphite. I was a little less patient with the branch… but I did convince myself to give it some attention. The lovely and talented Kerfe and Nina at Method Two Madness are hosting Draw a Bird Day this month. Wow! Thanks Charlie :-). What a delightfully enthusiastic compliment! I think the feet were my favorite part… all those little bumps. I did redraw them a few times though. The eyes speak. Lovely drawing. Thanks Sherry :-). I stared into those eyes a long time! I ended up naming the owl. Wow! Holy cow! Fantastic! Spectacular! and the eyes. Really good. Aw, thanks Kirk :-). I appreciate all your exclamations! Looks like an etching. Absolutely beautiful job. N.
Wowza! Way to go Myr. Extraordinary !!! Thanks Kerfe :-)! I practiced drawing the eyes on their own a few times to get a feel for them. Omg, Myriam! You need to start showing your art in galleries! This is so gorgeous!! I can imagine doing such great details…and I don’t. LOL! Love this! Thanks Teresa :-)! You’re so sweet! Working on one bird for many days was a first for me. I may try it again. Oh my this is superb! Frame it!! Wow, this is really amazing. So much detail! Love it! Very impressive, you have quite the talent! 🙂 Beautiful in detail. Thanks Eliza :-)! I have a bit of trouble sitting down to draw though (I like moving around). Drawing takes a lot of practice. Oh well! Love this! From the beautiful eyes to the detail of the toes and even the lovely branch and of course, all the fine feathery attention to detail in between. Should be framed and admired daily. Thank you so much for sharing this beauty. Thanks for your compliments Haunani :-). I’ll ask Olivia (the owl) if she (or he?) would like to be admired daily ;-). Very nice. I could find room for improvement. But, everyone else is so enthusiastic. So, I will just sit and smile, too. 😀 hehe As others say, plenty of detail which even I fail to include. Thanks :-). Way to go with the flow of contagious enthusiasm! Woo! Aw you’re sweet :-). Thanks Laura. I did finally buy some Polychromos color pencils!!! But I haven’t used them yet. But soon… Lately I’ve been choosing movies over drawing. Oh, I’m starting a weekly watercolor class this week! I think that will be motivating. Never thought of myself as a Crazy Owl Lady. But it sounds like a cool alternative to Crazy Cat Lady. I like it! I did meet a self-described crazy bird lady at the store the other day. She eats her meals with one cockatoo and two cockatiels. Reminded me of Julie Zickefoose. Great sketch! Love the detail. Wow! Love all the details.